It’s time for roasted vegetables to be on the menu, and we hope this collection of The BEST Low-Carb Roasted Cauliflower Recipes will give you ideas you want to try over the weekend! Use Cauliflower Recipes for more tasty ideas with cauliflower or Low-Carb Recipe Round-Ups to find more round-ups like this one. 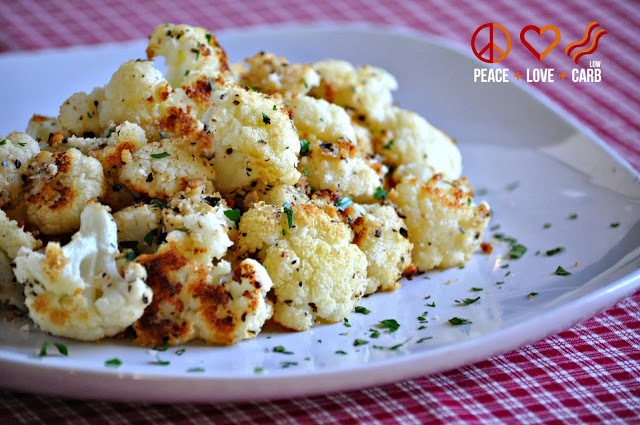 Click here to PIN this collection of Low-Carb Roasted Cauliflower Recipes! It’s already snowed twice at my house, so I guess there’s no denying winter is here. There isn’t much I like about winter weather, but I do like winter foods, including the way the arrival of cold weather makes it appealing to put roasted vegetables into a starring role for dinner side dishes. I love roasting most any kind of vegetable, but roasted cauliflower is one of my absolute favorites, so to welcome the arrival of the colder weather I’m reminding you about this great collection of The BEST Low-Carb Roasted Cauliflower Recipes from bloggers around the web. 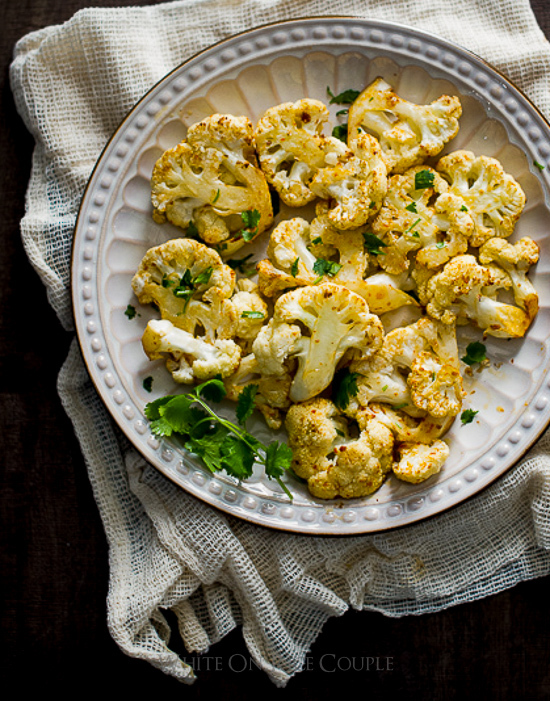 There are enough tasty roasted cauliflower ideas here to keep you trying them all winter long! Of course I’m well aware that there are people who “don’t like” cauliflower, so let’s have that conversation. If you’ve tried roasted cauliflower and still didn’t like it, then okay, you might be a confirmed cauliflower hater. BUT, if you’ve never been that fond of cauliflower but you haven’t had roasted cauliflower, I beg you to give one of these amazing Low-Carb Roasted Cauliflower Recipes a try! Roasting cauliflower brings out a sweetness and nuttiness that other cauliflower preparation methods just can’t produce. And there is none of that unwanted smell that’s sometimes associated with cooking cauliflower; cauliflower smells amazing when it’s roasting in the oven. And for people who are cauliflower fans, you may want to try every single recipe in this collection of The BESt Low-Carb Roasted Cauliflower Recipes! This Roasted Cauliflower Rice with Red Pepper, Green Onion, Parmesan, and Pine Nuts from Kalyn’s Kitchen was the first time I tried roasting Cauliflower Rice, and it was amazing. I think this is pretty enough to be a holiday side dish! 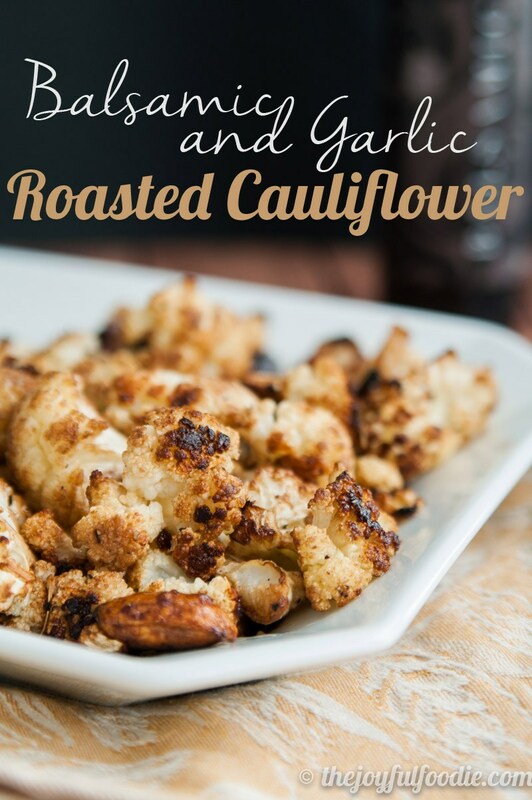 When I say Garlic Parmesan Roasted Cauliflower from Peace, Love, and Low Carb, I hope your first thought will be “That has to taste amazing.” This just went on my cauliflower to-do list! I love the updated photos for this Roasted Cauliflower with Parmesan from Kalyn’s Kitchen and I wrote about a new-and-improved preparation method that made this even more of a WOW! This is an absolute must-try, trust me on that! Balsamic Vinegar is one of my preferred ingredients to use on roasted vegetables, but I’ve never thought of balsamic on cauliflower and this Balsamic and Garlic Roasted Cauliflower from The Joyful Foodie sounds like a home run to me! Use good aged balsamic for best flavor here. If you’ve had roasted garlic then you know why this Roasted Cauliflower with Garlic from Kalyn’s Kitchen is such a complete WOW. I think this is a must-try recipe for cauliflower fans! I am 100% intrigued by this whole Roasted Spicy Cauliflower from Apron Strings. Donna says she doesn’t like cauliflower, but this recipe won her over. Be sure to check out the interesting cooking method that creates that spicy crust on the outside of the cauliflower; this sounds like a winner! Thai Roasted Cauliflower with Spicy Peanut Dipping Sauce from All Day I Dream About Food sounds like a winner to me! Carolyn says the roasted cauliflower is so good, you almost don’t need the dipping sauce! Another roasted cauliflower recipe that’s so good you can even serve it for a holiday meal is this Roasted Christmas Cauliflower with Red Pepper, Green Olives, and Pine Nuts from Kalyn’s Kitchen. And my deepest apologies for mentioning Christmas before it’s even December! Here’s another variation of Whole Roasted Cauliflower from Ditch the Carbs, and Libby has flavored this with mustard and lemon, as well as a few other spices, which I think sounds amazing! If you want roasted cauliflower as a meatless meal, these Low-Carb Roasted Cauliflower Slices with Red Pepper, Caper, Lemon, and Olives from Kalyn’s Kitchen are delicious and easy to make! Bacon and Blue Cheese Roasted Cauliflower Wedges from Joy Filled Eats, yes please! Do you love the sound of this as much as I do? Roasted Curried Cauliflower with Lemon and Cumin from Kalyn’s Kitchen is another interesting flavor combination where roasted cauliflower is a wow! 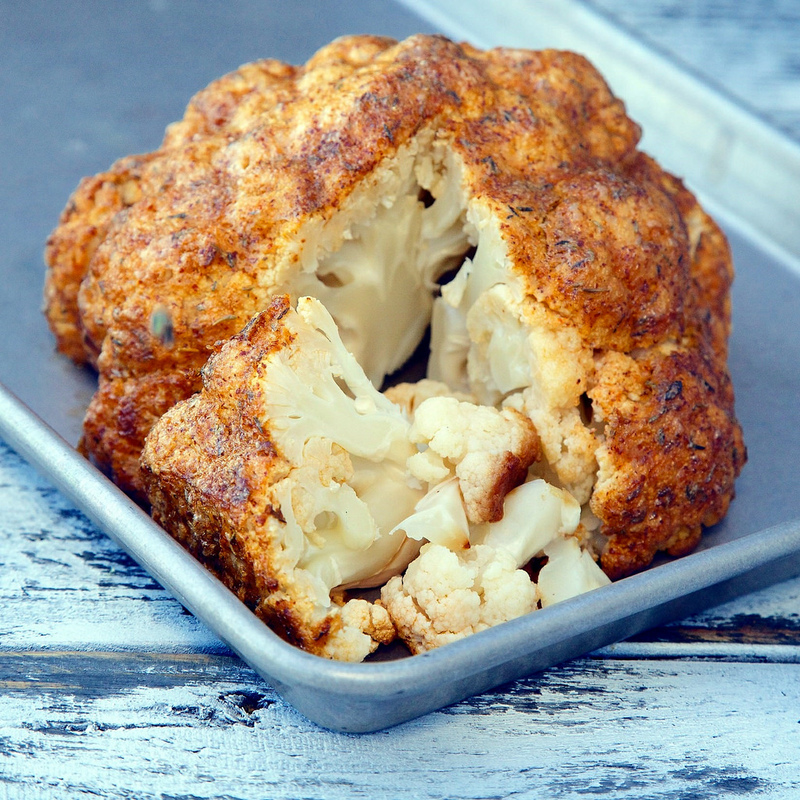 Italian Oven Roasted Cauliflower from Cook the Story has Italian flavors of course! Doesn’t that look good? And finally Roasted Cauliflower Steaks with Pesto and Mozzarella from Our Best Bites is something that sounds like a total winner to me! Can I roast vegetables using extra virgin olive oil at your high temperatures at 425° and 450° or will I burn the evoo? I’m wondering if I have to use plain olive oil. I’ve always used EVOO for all my roasted vegetable recipes and never had a problem! Can I get your recipe for instant pot low carb loaded cauliflower soup? Hi Leisa, You can find the Instant Pot Low-Carb Loaded Cauliflower Soup recipe here. And just FYI, you can find any recipe on the blog by putting the title into the search bar. Hope you enjoy the soup! Oh yeha!!!! My mouth is watering! I’m trying this tonight! Thanks for the ifea$!! Thanks Kacey, glad you like it! I hope I live long enough to make all the FABulous recipes you post. Another FABulous roundup! Thanks Donna! I hope we BOTH live that long! Will I ever learn to love cauliflower? I'm not sure, but I'm going to share this post with my cauliflower-loving friends! Gonna have to try the Garlic Parmesan Roasted Cauliflower this weekend. Thanks! Hope you enjoy Amanda; I think that sounds amazing!